It’s Thursday, January 31, 2019, and I must hie myself downtown for a “Global Entry” interview, conducted by U.S. Customs and Border Protection to see if I’m trustworthy enough to breeze through customs upon returning to the U.S. from overseas (I already had such an interview for “TSA Precheck”. But, though the government is now open, I got an email a while back saying that interviews should be rescheduled in light of the shutdown. My calls to the Global Entry number, always busy, haven’t been returned. And so I must go into the cold not knowing if my interview is on. 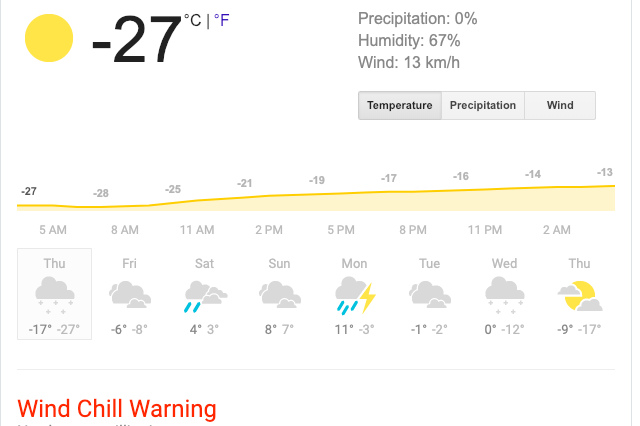 Here’s today’s weather forecast, first in Fahrenheit and then in Celsius. 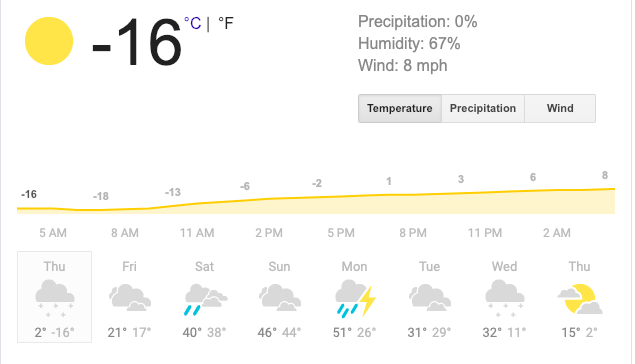 Notice that the temperature high is about 6°F and -13°C! There will also be more snow. Note that temperatures will rise to above the freezing point on Saturday, and even get a bit temperate on Monday, but we’ll also have rain. My walk to work this morning was palpably warmer than yesterday, but it’s still bloody cold. You can see pictures of our frozen city here, but the picture below is the saddest one. Although Chicago has “warming centers”, I’m told that some homeless people would rather take their chances on the street, and some are also mentally ill. Others may not have gotten the word. This is unconscionable. On this day in 1606, Guy Fawkes was executed for plotting against the King and Parliament. On this day in 1865, two events occurred in the U.S. First, Congress passed the Thirteenth Amendment to the Constitution, abolishing slavery. It was submitted to the states for ratification, and was ratified on December 18. Second, as the Civil War wound down, it was on this day that Robert E. Lee was appointed “general in chief” of the Confederate Army. Notables born on this day include Franz Schubert (1797), Zane Grey (1872), Tallulah Bankhead (1902), Jackie Robinson (1919), Norman Mailer (1923), Ernie Banks (1931), Philip Glass (1937), Nolan Ryan (1947), Minnie Driver (1970), and Justin Timberlake (1981). Those who died on January 31 include Guy Fawkes (1601; see above), John Galsworthy (1933), A. 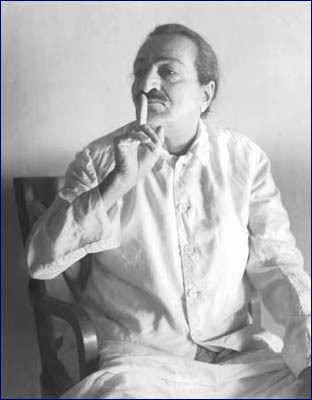 A. Milne (1956), Meher Baba (1969; see above), and Giant Baba (1999; no relation). 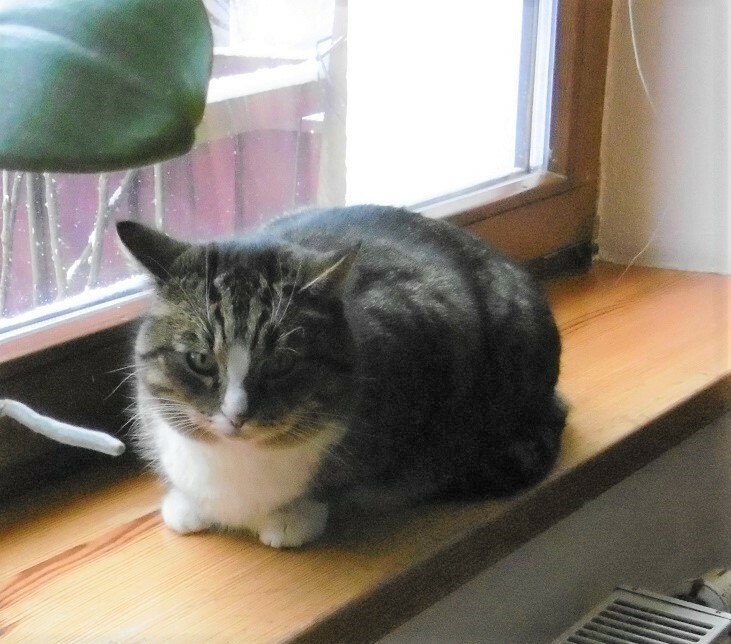 Meanwhile in Dobrzyn, Hili is trying to think. Hili: What is more conducive to critical thinking – an armchair or a sofa? Hili: Co bardziej sprzyja krytycznemu myśleniu – fotel czy sofa? 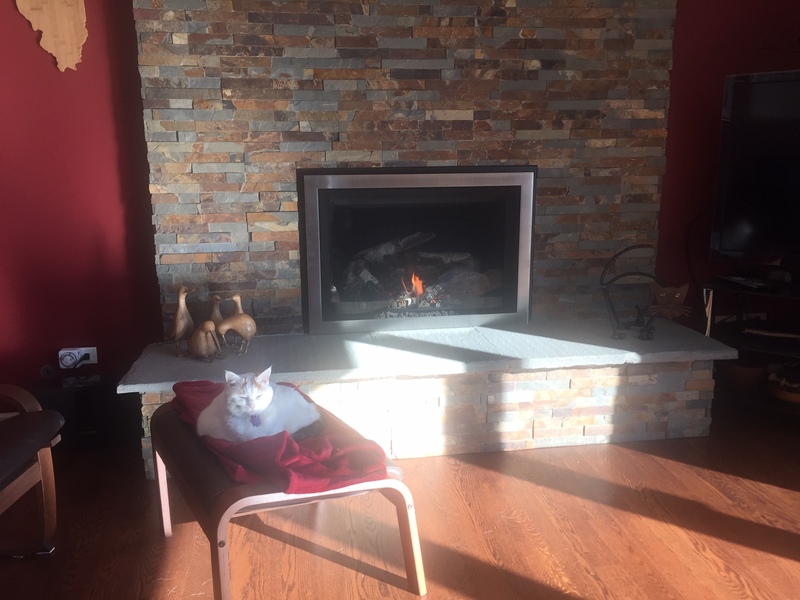 Reader Simon, a researcher living in the north suburbs of Chicago, who had to stay home from work yesterday because of the weather, sent me a picture of his cat with the caption “Sunshine and a fire. Profound wisdom! She’s not used to having staff home on weekdays 😀.” (Photo below). I’m guessing she’ll be 18 sometime around mid-late June, still has plenty of bounce but is serious about collecting zzzzs. (Still asleep now in the position I photographed her, but with her head down). She considers that fire to be our best use of money since we moved to Chicago. 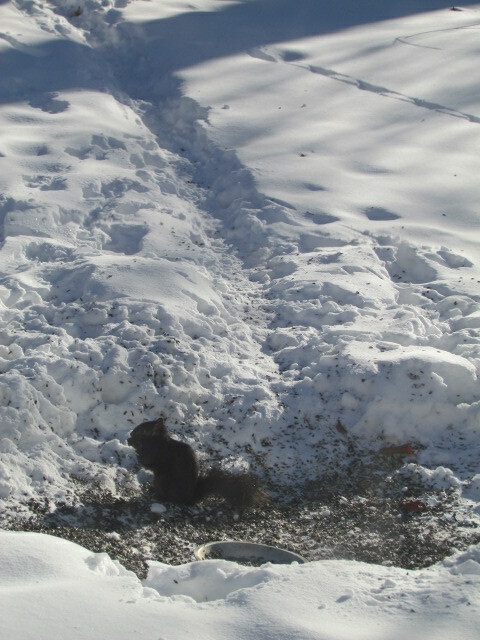 Each morning I scatter sunflower seeds for the birds and squirrels (and, in warmer seasons, chipmunks). When I got up today it was -21F but I did my duty, and I did get one intrepid customer. Note the well-worn path through the snow to a large maple tree which is the on-ramp to their arboreal highway system. Matthew directed me to the #UnscienceAnAnimal Twitter site, which is pretty hilarious (warning: a lot of twee, too) and also shows that scientists have a sense of humor. The goal is to describe an animal completely nonscientifically. Here are just a few good ones, and I’ll use all the space for tweets today to show them. Wow, #UnScienceAnAnimal is a fun hashtag. BREAKING FACTS! The true anatomy of the spotted #hyena Crocuta crocuta. This entry was written by whyevolutionistrue and posted on January 31, 2019 at 6:30 am and filed under Hili Dialogue. Bookmark the permalink. Follow any comments here with the RSS feed for this post. Both comments and trackbacks are currently closed. In London, even with windows open it was still 16 C by my bed this morning, despite frost on the window – I use the duvet cover with the duvet shaken to one side as I get too hot! We can’t all live at The Ritz. Blackheath was arctic. Today is only teenage wasteland, but then again, so is every day, amirite? Fifteen found frozen to death just in Chicago alone. Must be part of that exceptionalism we never get tired of hearing about. On January 31, 1945, Private Eddie Slovik was executed by the U.S. for desertion during WWII. It was the first execution for desertion since the Civil War, and I believe it was the last. Dwight Eisenhower, as commander of the Allied Forces in Europe, had the chance to stop that execution, but he let it go forward as a lesson to the others — just as, as president of the United States, he let the execution of the Rosenbergs go forward in June 1953. It would’ve been a condign conclusion to his presidency, you ask me, if Ike spent his final days in the White House sleepwalking through the halls of the central residence trying to wash their blood off his hands, as Lady Macbeth stumbled through the halls of Dunsinane Castle trying to wash off the blood of Duncan. And then to think Mr Eisenhower is considered the be the last Great Republican president. Well, I guess all presidents have blood on their hands. What eg about Mr Clinton and his (lack of) actions during the Rwandan genocide? At least he admitted he fell way short there and apologised. Obviously he keeps up on his Voltaire. I just fact checked the story about 15 homeless people dying in Chicago. Snopes says it is a false story. I looked at the Chicago Tribune online and couldn’t find a story about 15 people dying. The New York Times reports that at least eight people are dead from the storm but doesn’t mention 15 dead homeless people in Chicago. I saw a CBS story that reported a total of 9 deaths due to the storm nation wide so it very well could be wrong. I do only have very moderate confidence in Snopes, but indeed there appears not to have been 15 deaths in Chicago. That being said, one is one too many. The account is now blocked. That photo of the homeless person is one of the saddest things I have ever seen. Maybe it’s time we, so called civilised countries took a look at what Finland has been doing. There’s that nasty “socialism” at work. A country that puts its people first ahead of corporations and billionaires. What a concept! What’s next? Free healthcare and education? Oh wait. They have that too. Finland also has the highness standard of education in the world apparently. Why is it so difficult for a rich nation such as the U.S. to copy what works in Finland? Could it be greed? We could do much better in Canada too. We have socialized medicine, but we have lots of homeless sleeping out in the cold. And some students come out of university with a crippling debt load. Right now, in Ontario, we have an uber right-wing, (and uneducated) populist premier who is busy cutting social services and student grants. F***ing disheartening. The cost of shelter is too high in Canada…I don’t know what it is elsewhere but my mom found an apt rental notice from a one bedroom apt they lived in during the early 70s. The cost was about 2% of my dad’s income as a factory worker. Now, it’s closer to 75% of your income for a person making a good middle class wage. And the middle class family home is basically no longer a thing in many of the cities, too. AND they are raking their forests! Seriously, the exceptional cold spell in the Mid-West and East of the US is a kind of unusual weather (NOT: climate). A meteorologist acquaintance of mine tried to explain it to me: due to the higher temperatures at the North pole, this polar air is likely to move slower at lower latitudes and hence get these areas really cold, since lingering longer. I can’t say I got all of it, but it appeared to make some sense. Short of it: he attributed this particularly cold weather to global warming. There you go, Snowball Inhofe! Note, here in SA the numbers of homeless (‘bosslapers’) is vertiginous. There are no actual numbers, but looking at the numbers in a small town and extrapolating, it could be more than a million. In a (relatively) poor country, which has recently been impoverished even more by a rampantly corrupt regime under Mr Zuma, this is a close to insurmountable problem. The recovery under non-corrupt Mr Ramaphosa still encounters many hurdles. The photograph of the homeless man sleeping on the sidewalk was taken in Toronto by Darren Calabrese and first published in the National Post on January 22, 2013. In no way did I intend to minimize the horror of the photo from the tweet. I just wanted to point out that the tweeter’s facts were suspect. I have also heard stories about the great efforts individuals are making to get the homeless folks out of the cold. The tweet apparently wants to make the point that we’re all such selfish bastards that we let people freeze to death. I’m 99% certain it’s a new account troll tweeter who isn’t trying to make such a point – the range of subjects he’s tweeted about don’t hang together. Twitter has eliminated 10s of thousands of these accounts recently & they’re busy setting up again. The aim of these people [or the orgs paying them] is to raise the temperature on each side of every issue & sow discord. So we have a homeless street sleeper from Toronto 2013 repurposed for Chicago 2019. I gather the biggest problem in snowy Chicago is elderly, isolated people with homes who can’t get out & can’t keep warm. The season of the broken hip for some of those that do venture out. In a post-truth world does it really matter? The picture conveys a message and the message is pretty much true so what do details about the picture matter? Although my comment seems to belie it, i wholeheartedly concur. Unfortunately at most sites incorrect claims are seldom corrected. How many people actually read the comments to most blogs? Millard Fillmore’s Bathtub, perhaps in part because it is so sporadic, is one of the few blogs that actually seems to appreciate updates. Twitter is a BIG problem, perhaps because of the characters limit – rarely do I see any material credited, referenced, linked. If I used Twitter I’d feel obliged to, but few seem to care about reusing images & other content uncredited. It’s -22 C here right now without windchill & -33 C with. When I came into work, I have to walk a bit outside. Only my legs were cold. I need snow pants. Here it started out at 21°C this morning but will go up to 33-34°C this afternoon. Forecast for tomorrow is to be a little hotter. Careful what you wish for. -37°F (-38°C) at my house this morning! I’ll bet 4chan could convince the media types that the “shh” gesture is a white supremacist hand sign. Si non e vero e ben trovato! So originally the painters complain because the adhesives are too sticky and then they complain because the first test samples are not sticky enough? Was this at Goldilocks’ Auto Painting? Wikipedia give no clue why it was called “Scotch” tape.